A company in Italy has already produced a 1.5 tonne simulated lunar building block. 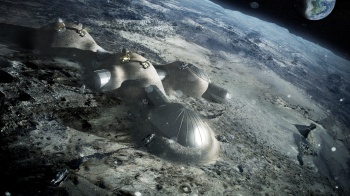 The European Space Agency has a new idea: to build a moon habitat using an inflatable dome, then cover the dome in rock solid, 3D printed lunar soil. 3D printing has already been used to make buildings piece by piece, but nobody had yet investigated whether it might be possible in the lunar environment. Working with the ESA, architects Foster + Partners have devised a structure that might work: a weight-bearing dome with honeycombed hollow chambers, much like a beehive. The structure keeps down weight while maximizing strength. While the engineers and architects found some problems with trying to 3D print in vacuum, they feel confident that it will work. In theory, the lander for a mission would include a 3D printing robot and the inflatable habitat, which the robot would cover with a protective regolith dome. Monolite, a UK-based company, helped build the printer and figure out how to make lunar regolith into a usable printing material. "First, we needed to mix the simulated lunar material with magnesium oxide. This turns it into 'paper' we can print with," said Enrico Dini of Monolite. "Then for our structural 'ink' we apply a binding salt which converts material to a stone-like solid." Monolite is now working on speeding up the process. "Our current printer builds at a rate of around 2m per hour, while our next-generation design should attain 3.5m per hour, completing an entire building in a week." The tests were undertaken using basalt rock from a volcano in central Italy, which has a 99.8% resemblance to lunar soil. An Italian research firm, Alta SpA, headed up the part of the project working to figure out how to get the printing process to work in space. "The process is based on applying liquids but, of course, unprotected liquids boil away in vacuum," said Giovanni Cesaretti of Alta. "So we inserted the 3D printer nozzle beneath the regolith layer. We found small 2mm-scale droplets stay trapped by capillary forces in the soil, meaning the printing process can indeed work in vacuum."